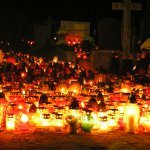 All Saints' Day in these countries is celebrated like in other European countries. People go to special servings, as well in other Catholic countries. Priests chose white vestments to serve the Mass. The Feast is as Holy Day of Obligation, it means, that Catholics must attend the Mass. They are allowed to miss it only if there is a good reason, for instance illness. The Feast of All Saints is observed by Western Christians to honor all saints, known and unknown. The Swedes and Finns have a tradition to light the candles and visit the graves of deceased relatives. The lit candles are placed on the graves on All Saints' Eve. This tradition is common to other European countries as well.